Custom Inflatable Gladiator Joust, 21' x 18' with Embossed Wall with LogoThis fun inflatable is just like the real thing and is excellent for all age ranges right up to adults. Two players stand on the cushioned platforms above an inflatable mattress and try to knock each other off with the padded feudal sticks. Our inflatable gladiator duel makes an exciting indoor or outdoor activity. Comes Complete with Padded Dueling Sticks and Safety Helmets. Participants climb on top of a rocking pedestal in an attempt to nudge each other off with their foam padded fugal sticks. Inflatable Gladiator Duel or Gladiator Joust. Maybe its your birthday, holding an event or the neighbors have chipped in for some joint fun. Book out the Gladiator Duel in Pods Party Packs for an extra special day. Rates for packs are exceptional value, so go ahead and book today. 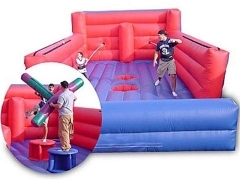 Our inflatable gladiator duel makes an exciting indoor or outdoor activity. Participants climb on top of a rocking pedestal in an attempt to nudge each other off with their foam padded fugal sticks. Put on your head guard, pick up your padded feudal sticks and joust your opponent. 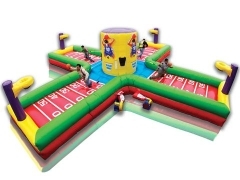 Inflatable rocking gladiator duel or gladiator joust is perfect for family fun days or any event. Put on your head guard, pick up your padded feudal sticks and joust your opponent. The inflatable mattress measuring 17ft by 20ft cushions the fall from your turret. The best of three knock downs....Wins! Rock 'n' Roll Gladiator Joust. This fun inflatable gladiator joust is just like the real thing and is excellent for all age ranges right up to adults. Two players stand on the cushioned platforms above an inflatable mattress and try to knock each other off with the padded feudal sticks. This Rock Climb & Slide is a race against an opponent and a test of your own skill. Each of two competitors tries to climb up the hard ladder. The one who makes it to the top first wins. Of course, if you fall, there is a nice soft inflatable floor to catch you. Jacob's Ladder Race, Jacob's Ladder Challenge is perfect for all corporate, church, carnival, school, and fundraiser events. This game is built for two, each player races up a ladder to see who wins, making the Jacobs Ladder Bounce House perfect for older kids. Include 2 ladders, steel work, hardware, 1 blower. Jacob's Ladder is perfect for all corporate, church, carnival, school, and fundraiser events. This game is built for two, each player races up a ladder to see who wins, making the Jacobs Ladder Bounce House perfect for older kids. Include 2 ladders, steel work, hardware, 1 blower. Jacob's Ladder is perfect for all corporate, church, carnival, school, and fundraiser events. This game is built for two, each player races up a ladder to see who wins, making the Jacobs Ladder Bounce House perfect for older kids. 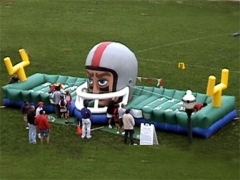 Custom Inflatable Touchdown Challenge & Double Lane Bungee Run. It is great for corporate functions and exciting entertainment for parties, festivals and fun fairs. The Touch Down Challenge will bring the spirit of competition of football and make your event a touchdown! First Down Sports Challenge. Its like being on a Bungee Run against a person, the more they pull the more you spring back! It is great for corporate functions and exciting entertainment for parties, festivals and fun fairs. The Touch Down Challenge will bring the spirit of competition of football and make your event a touchdown! 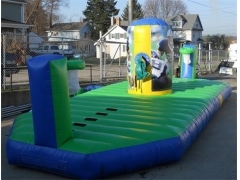 Double Lane Inflatable Touchdown Equalizer Bungee Run. A thrilling inflatable challenge, great for corporate functions and exciting entertainment for parties, festivals and fun fairs. The Touch Down Equalizer will bring the spirit of competition of football and make your event a touchdown! The Touchdown Football Challenge adds excitement to the bungee run interactive with a football theme. The goal is to try to reach the end zone and score a touchdown before the other player scores. The hard part is both players are harnessed with one bungee cord with only enough bungee cord for one person reach the end zone. A great team building game! Similar to our Touchdown Challenge, this game has four lanes instead of two. The goal is to try and run down the field and score a touchdown before the other player make a touchdown. The hard part is 2 sets of players are harnessed with one bungee cord and there is only enough cord for one person on each bungee cord to reach the end zone. A great team building game! The Bungee run is fantastic, compete against your opponent, see if you can get the furthest. This giant inflatable bungee run has an extra lane and is ideal for fetes etc. Comes with harness's and bungee cords. This inflatable bungee run is suitable for all ages and is great fun. Hours of fun. Bungee Joust Combo! The Bungee run is fantastic, compete against your opponent, see if you can get the furthest. 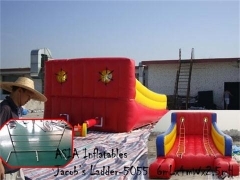 This giant inflatable bungee run has double lane and is ideal for fetes etc. Comes with joust,harness's and bungee cords. Hours of fun. Double Lane Bungee Run! The Bungee run is fantastic, compete against your opponent, see if you can get the furthest. 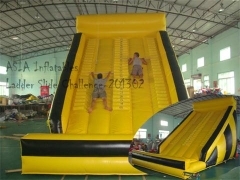 This giant inflatable bungee run has double lane and is ideal for fetes etc. Comes with harness's and bungee cords. Custom Inflatable Bungee Run,Bungee Cord and Bungee Harnesses. The Bungee run is fantastic, compete against your opponent, see if you can get the furthest. 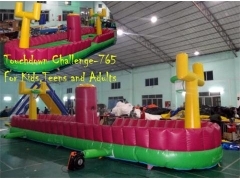 This giant inflatable bungee run has 1-3 lane and is ideal for fetes etc. Comes with harness's and bungee cords. To avoid disappointment please book this inflatable early. Triple Lane Bungee Run,Bungee Basketball. The 3-Lane Bungee run is fantastic, compete against your opponent, see if you can get the furthest. This giant inflatable bungee run has an extra lane and is ideal for fetes etc. Comes with harness's and bungee cords. To avoid disappointment please book this inflatable early. Hours of fun. Twin Lane Bungee Run! The Bungee run is fantastic, compete against your opponent, see if you can get the furthest. 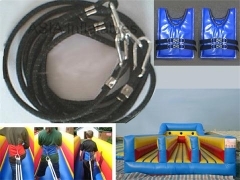 This giant inflatable bungee run has twin lane and is ideal for fetes etc. Comes with harness's and bungee cords. This inflatable bungee run is suitable for all ages and is great fun. 3-Lane Bungee Run. The Bungee run is fantastic, compete against your opponent, see if you can get the furthest. 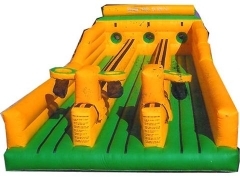 This giant inflatable bungee run has an extra lane and is ideal for fetes etc. Comes with harness's and bungee cords. This inflatable bungee run is suitable for all ages and is great fun. 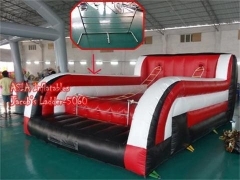 This giant inflatable bungee run measure an outstanding of 1 2mLx3.3mWx2.2mH. Comes with harness's and bungee cords. Double laned, Contestants can run individually or against one another. Put harnesses on, and see who can run the furthest, Velcro battens mark your distance. Try your strength, then 'fly' back. Double Laned Bungee Run, Twin Lane Bungee Run. Double laned, Contestants can run individually or against one another. Put harnesses on, and see who can run the furthest,Velcro battens mark your distance. Try your strength, then 'fly' back. To avoid disappointment please book this inflatable early. Twin Lane Bungee Run. This giant inflatable measure an outstanding of 10.3mLx3.3mWx2.7mH. Comes with harness's and bungee cords. The Bungee run is fantastic, compete against your opponent, see if you can get the furthest. This giant inflatable is ideal for fetes ect. To avoid disappointment please book this inflatable early. Three Lane Inflatable Bungee Run. Comes with harness's and bungee cords. The Bungee run is fantastic, compete against your opponent, see if you can get the furthest. This giant inflatable has an extra lane and is ideal for fetes ect. To avoid disappointment please book this inflatable early. Outdoor Inflatable Twister Party Game! It is suitable for children & adults alike. If you fall over you're OUT! Watch the fun on our giant inflatable bouncy twister board, as players try thier best to keep thier balance, the more players the more fun, see who can be a winner, it's not easy!! Inflatable Twister Board & Twister Spin Wheel! It is suitable for children & adults alike. If you fall over you're OUT! Watch the fun on our giant inflatable bouncy twister board, as players try thier best to keep thier balance, the more players the more fun, see who can be a winner, it's not easy!! Carnival Inflatable Twister Games! It is suitable for children & adults alike. If you fall over you're OUT! Watch the fun on our giant inflatable bouncy twister board, as players try thier best to keep thier balance, the more players the more fun, see who can be a winner, it's not easy!! Inflatable Twister Games! It is suitable for children & adults alike. If you fall over you're OUT! Watch the fun on our giant inflatable bouncy twister board, as players try thier best to keep thier balance, the more players the more fun, see who can be a winner, it's not easy!! 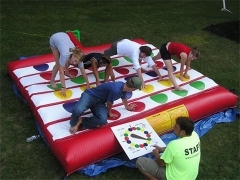 Bouncy Twister Game,Inflatable Twister,Inflatable Twister Game. 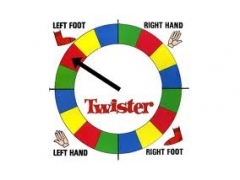 This inflatable game of Twister, takes the tradional board game to a new level. Up to 8 people can play at one time.The spinner instructs the players of the next move and must be obeyed at all times. This inflatable game of Twister, takes the tradional board game to a new level. Up to 8 people can play at one time.The spinner instructs the players of the next move and must be obeyed at all times. Bodies become entangled, limbs out of wack, but all body parts except hands and feet must be kept off the inflatable bed to stay in the game. The last person to remain with only hands and feet on the board is the winner. Carnival Velcro Sticky Wall,Inflatable Velcro Wall and Velcro Suits. Comes complete with 2 Special Suits completely covered in velcro. Run, jump and see how high you can stick to the Velcro Sticky Wall? We can customize the design, the size, the colors and the logos as you need. Fantastic Fun Velcro Sticky Wall,Inflatable Velcro Wall and Velcro Suits. Comes complete with 2 Special Suits completely covered in velcro. Run, jump and see how high you can stick to the Velcro Sticky Wall? We can customize the design, the size, the colors and the logos as you need.